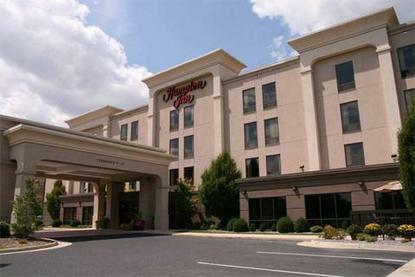 Opened in September, 2001, the Hampton Inn of Waynesboro/Stuarts Draft contains 66 comfortable rooms and a beautiful, heated indoor swimming pool. All rooms contain a refrigerator, microwave, coffee pot, hairdryer, iron, ironing board and 27 inch television with over 50 channels of cable television, including HBO, ESPN and CNN. A perfect location for business or leisure, we are situatated at the crossroads of the Shenandoah Valley. The rolling hills and pasteural setting provide a quiet and relaxing atmosphere. Whether you are doing business with one of our local companies or coming to the area to enjoy history, culture, nature or sports, we are the perfect location for you. The hotel is off of exit 91 of Rt. 64, just 5 minutes from Waynesboro, Staunton and Stuarts Draft and just 25 minutes from Charlottesville. The hotel is also conveniently located to those traveling on Rt. 81, just 5 minutes east on Rt. 64.